The bass player on left in the picture trying to grow a beard is me, Bill Anderson, I played with the group from 1958 to 1963, when I left for college in Davenport Iowa and hooked up with well established band in Rock Island, Illinois called the Decipals. 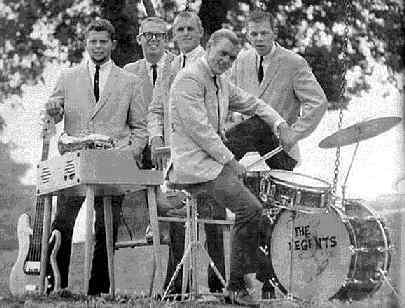 "The geeky guy on the right next to the drummer is me, Chuck Cox. I played the Wurlitzer electric piano in the photo. Still wish I had it, as its funky tone has yet to be duplicated on modern keyboards. I was with the band from 1958 through 1963. Our greatest moments were playing at the Island County Fairgrounds each year. What a blast!"